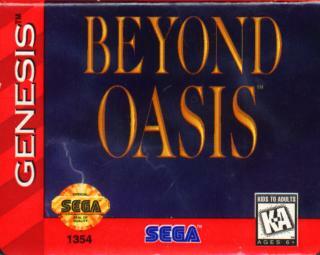 One part Zelda and one part Street Fighter, Beyond Oasis is a great game. 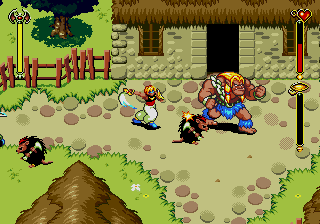 The graphics are beautiful, easily comparable to the best looking snes games. 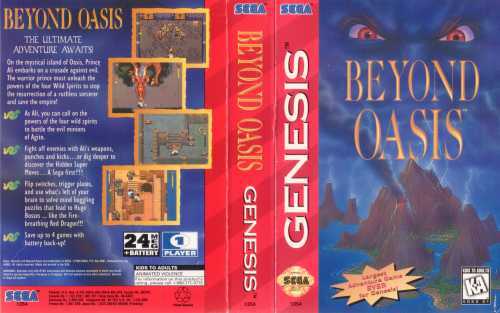 The Zelda part comes in when you have to kill enemies with different weapons, mainly your sword, and also when you have to explore great caverns and find familiars. These creatures give you magical properties and make the game more interesting by having you use their powers to solve puzzles that involve fire, water, shadow, and more. Now the streetfighter part is in that you can do special moves with the d-pad, doing cool sword moves. 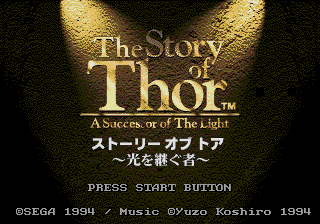 The story is about a prince who likes to find treasure, but you can find out more by playing it. The game's music is ambient and doesn't come on too strong. The challenge is great because of all the puzzles you'll run into. There's only one town and one kingdom(similar to zelda) but there's enough here to keep you interested. Just remember to read a faq if you get stuck! 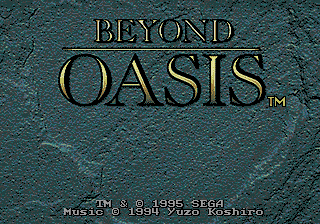 I highly recommend this game to any adventure fan, also check out the saturn sequel. I give it a 9. Yes, I'd agree wholeheartedly with Hiryu on this one! A truly great action RPG game, similar in a few respects to Zelda, but has a number of features that bring this game into it's own. The fighting is great, simple but effective - you can perform a number of fighting moves with your dagger/sword, none of which are that hard to pull off (except one or two), this makes the action fast and exciting. Coupled with the ability to summon and control various elementals adds to the variety of the battles. An awesome action RPG that keeps you coming back for more.. highly recommended! I love this game...and the idea of collecting all the different magics is really cool...and this game is tough. On a par with Landstalker, in my opinion. This game is cool I beat it and got rank 111 but thats because I got stuck on the secret pit.